We love to hear from our customers! If you have any questions or comments, please use the secure form below to get in contact with us and a member of our team will get back to you as quickly as possible. Sap coming from the sugar maple tree typically only contains 2% sugar. However this is still one of the highest sugar contents of all tree species. 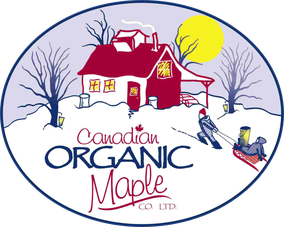 Canadian Organic Maple is the largest sugary in the world where all the sap is piped into a central location. Sap flow depends on weather conditions and is highly variable from day to day and year to year. The earliest sap flow at Canadian Organic Maple was February 20th, and the latest start date of sap flow was April 20th. 140,000 taps are installed on sugar maple trees in the Canadian Organic Maple sugarbush. It takes 40 liters of sap to make 1 liter of Maple syrup. That’s a lot of sap to make one bottle of syrup! Another way to think of this is: if you boiled down 1 liter of sap, it would make 1 teaspoon of syrup!